Our range of floor marking tapes are used widely in the marking of aisles, corridors, and floors. They can be used to identify pedestrian or traffic routes, layouts of factory areas and sports court boundaries, the marking of hazards or dangers, and the location of fire and first aid or safety equipment. The range is available in plain colours or with chevron designs. They are manufactured in 0.15mm vinyl with an aggressive, clear rubber based adhesive, and are suitable for most internal, sealed floor surfaces. These versatile tapes are abrasion resistant and can withstand reasonable traffic flow. 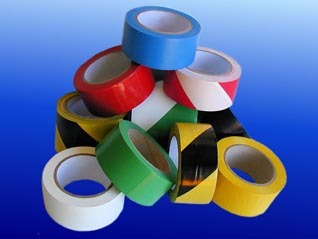 We also supply Safety & Floor Directional Tapes,Laminated Warning Tapes, Reflective Tapes, and Fluorescent Tapes. Safety and floor marking tape, black and yellow chevron. Safety and floor marking tape, black and white chevron. Safety and floor marking tape, yellow. Safety and floor marking tape, grey. Safety and floor marking tape, red and white chevron. Safety and floor marking tape, white. Safety and floor marking tape, red. Safety and floor marking tape, blue. Safety and floor marking tape, light blue. Safety and floor marking tape, green and white chevron. Safety and floor marking tape, green. Safety and floor marking tape, orange. Safety and floor marking tape, black. Safety and floor marking tape, brown. Safety and floor marking tape, violet.